'Cinderella' was her favorite fairytale as a child, so she entered her reception in a pumpkin carriage. 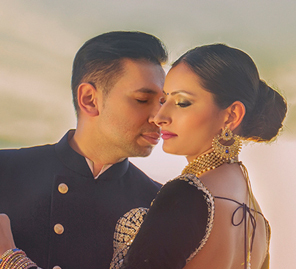 Find out some more interesting details of Khushboo and Rahul's picture-perfect Pattaya wedding. 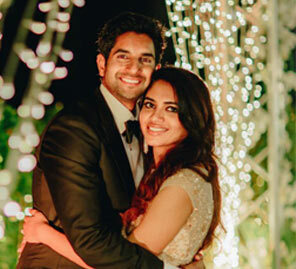 After a memorable proposal, Rahul and Khushboo planned their lavish wedding celebrations in Thailand with well-planned events, from a rave party to a reception inspired by London winters and 'Cinderella.' Take a peek into their nuptials at Dusit Thani Pattaya as bride Khushboo shares more details below. “The decor for this function looked like a ‘mela’ (fair). We had a truck bar, floral ‘jhula’ (swing), carts with mehndi favors, ‘dholwalas’ (traditional drummers), alongside lots of food, drinks, and dancing. Rahul and I entered in a tuk-tuk as I love auto rickshaws. I did a surprise performance for Rahul with my cousins and friends. The dress code for this event was ‘Pastel Paradise’ as I didn’t want people blending in with the decor. DJ Jeff was amazing as he kicked off the wedding celebrations with a bang.